REST (REpresentational State Transfer) is a communication method architecture that is often applied in the development of web-based services. REST API is run through the HTTP / HTTPS protocol. 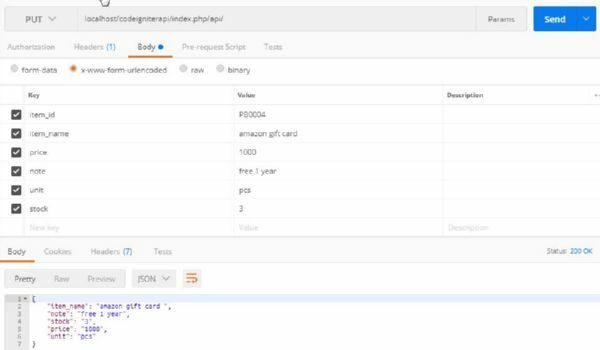 REST APIs involve the process of reading certain web pages that generate JSON format. After going through a certain definition process, consumers can access the data presented by the server side. The uniqueness of REST is the communication between client and server facilitated by some unique operational types (verbs) and Universal Resource Identifiers (URIs) for each resource. Each verb (GET, POST, PUT, DELETE) has special operational meaning to avoid ambiguity. 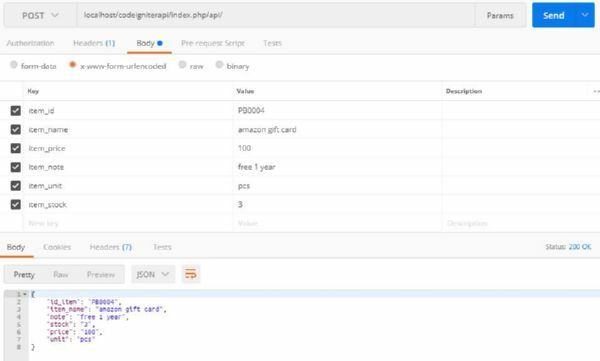 Okay, we started the CodeIgniter tutorial how to create a REST API with a simple example. We will skip this section because I’ve covered in the complete CodeIgniter tutorial in the article “Simple CRUD Apps With Codeigniter Tutorial For Beginners.” Please change your project folder as “codeigniterapi” folder. The database and tables used are still the same as the previous article “pos” database and “m_item” table. To shorten the time, please create a new MySQL database with the name “pos” and copy the following script to create “m_item” table and fill the dummy data. Copy the “application/libraries/Format.php” and “application/libraries/REST_Controller.php” files into your “application/libraries/” folder. Copy the rest.php from “application/config/rest.php” and paste in your application’s configuration folder. Create a web service to handle request data from “m_item” table. To test the script we have created above, you can use POSTMAN plugin on chrome browser or Firefox. In my tutorial using chrome browser, Please install POSTMAN. Note: for the REST Client project is continuing the example project previously made in the article “Simple CRUD Apps With Codeigniter Tutorial For Beginners” please download project first. Nice tutorial and it helps me a lot. Can you guide how to generate API key and put in login in Rest Client to access Rest Server? In short, how to make authentication from Rest Client to Rest Server? I am also getting this error.. I am getting error when I run sql queries. 4 errors were found during analysis. can i make like this?